Why We Love House Sitting And Why We Do It! “I love house sitting!” is what I exclaimed this morning when I got out of bed at 6 am to feed the five dogs we are caring for. Despite the early hour I was not being sarcastic, I’m really loving every second of this house sit. Besides, 6 am is a huge improvement from the 5 am wake-up call on Sunday morning to the sound of Cohetes (Mexican celebratory skyrockets) but more on that another time. We’ve been here almost a week now and are very much settled into the cozy little house we are caring for in Jocotepec, Lake Chapala, Mexico. We met our host homeowners through Housecarers.com which is one of three sites that we use to search and apply for house sits all over the world and after some back and forth emails and an hour long Skype call we all decided it was a great fit. I’ll get into more detail on how house sitting works below so skip ahead if you like. But first here’s some photos of where we will be calling home for the next three weeks and the adorable dogs we are so happy to be caring for. This is our lovely little home for the next three weeks! Our hosts have a beautiful garden. Even fresh herbs…I’m in heaven! Lady and Honey, two of the wonderful dogs we have the pleasure of caring for. Dewey and Sadie…such little sweethearts. Precious little Shilo. He went blind last year but you’d hardly know it. Loving the kitchen! We haven’t had an oven for seven months because all of our apartments have only had stove tops. When we first started planning our nomadic lifestyle of course budget and cost of living were very big factors. As I’ve mentioned in a previous post titled ‘How We Plan To Fund Our Travel Life’ we are far from independently wealthy and are still in the start-up phase of our online businesses so our budget is quite tight. When living or traveling pretty much anywhere in the world the biggest cost is usually accommodations. So when we discovered these house sitting sites we were thrilled. 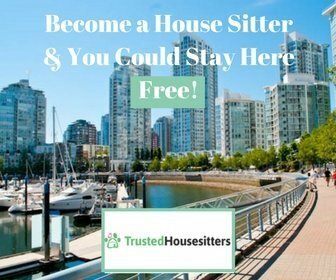 We had both done some house and pet sitting in the past but we had no idea that there were such great resources available to bring house sitters and home owners together. There are actually quite a few sites available and I will list the ones I’m familiar with on my resources page but the three we joined and have had the most success with are and TrustedHousesitters, MindMyHouse and HouseCarers . These three sites have listings from all over the world whereas some of the other sites are more specific to countries such as Australia and the UK. There is an annual membership fee in order to post a profile and apply or list sits but you can go to the sites and just browse the house sits and sitters for free to get an idea if it’s something that may interest you. For us, housesitting is a blessing as it allows us to experience living in a real neighborhood rather than a hotel. This alone has value to us beyond just the savings in accommodations as learning about other cultures is a big part of why we live this travel life. For the homeowners it is also a blessing as they can go away with the peace of mind of knowing that their home and beloved pets are being well cared for. This makes us feel great plus we really love having a home and pets to care for during our travels. It really is a win win! **If housesitting is something that interests you feel free to drop us a line with any questions. Also if you’d like to see an example of our own housesitting profile you can see it here. Update 2017: We will soon be releasing our own in depth guide on how to become a successful house sitter. If you want to be the first to know just sign up for our newsletter and/or drop us an email.